Did you know some children’s hospitals refer to the months out of school as the trauma months? In winter, many city hospitals see as few as 100 children with traumatic injuries each month. During the warmer season from April until September, traumatic injuries can double. So what can you do to protect your loved ones? 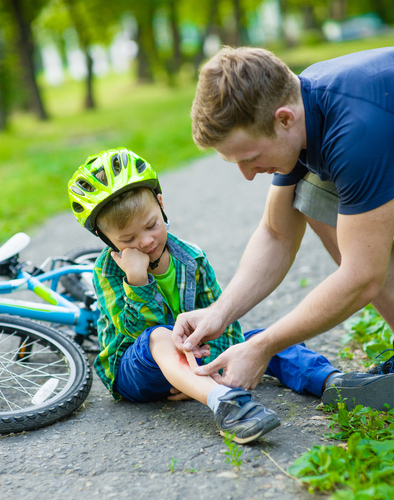 Children younger than the teen years have the biggest increase in injuries during the summer, and it makes sense why. After 10 months of being cooped up in school, kids finally have july and august to play, run around, jump, and enjoy the warm weather. Bicycles are a great way for kids to get around. They’re environmentally friendly, fast, and excellent exercise. Bikes teach balance and help kids learn the rules of the road from a young age. They can also be dangerous. Many children break or sprain their wrists and arms when they fall. Head injuries are also an extremely common traumatic injury. Make sure you child always wears a helmet, knows how to obey traffic laws, and stays away from busy streets. Parents are often very vigilant of their kids when they’re swimming in the lake or at a creek, but many guardians are happy to rely on lifeguards at the pool. With so few lifeguards and hundreds of people to watch, it’s not surprising that pool drownings and near-drownings are a common traumatic injury in younger children. Trampolines are a lot of fun. However, they do have obvious risks. Jumping high can easily turn to falling fast. When you add in numerous children on the same trampoline, you have an accident just waiting to happen. Ground level trampolines are safer than raised ones. Nets can also help prevent falls or flying off the tramp. We would suggest making sure your kids take turns and jump one at a time, but let’s be honest — that’s no fun at all. Dog Bites also spike during the summer. More dog-owners are out with their pets, and more kids are out unsupervised. Teach your child how to read dog body language, and make sure your child understands how important it is to ask the dog’s owner for permission before interacting with the pet. Finally, they should also learn how to recognize a service animal and that those dogs should never be petted. Those dogs are performing an important job, and their owners require them to remain undistracted. Gun injuries from rifles, pistols, and even paintball and airsoft guns cause numerous injuries — mostly to young boys — during the summer months. If you have guns in your home, you must keep them locked up, and children should never be allowed around firearms without strict supervision. Paintball and airsoft guns can also cause injury. Your child needs to be taught how to operate them safely and when it’s okay to use them. Spending lots of time outside getting exercise and testing their limits is great for children. Scrapes, bruises, and falls are important for child development even if we as parents and health care provider cringe at the idea. However, limiting risk is important. A scraped elbow and a broken arm are very different injuries. While these are the main traumas disproportionately affecting children, some injuries such as driving accidents, sunburns, insect bites, punctured feet (from running around barefoot! ), and falls also increase dramatically during summer — they just affect children and adults more evenly. If you have any questions about keeping your family safe during the summer, the experts at Health Risk can help! Call us today 1-877-236-9430.